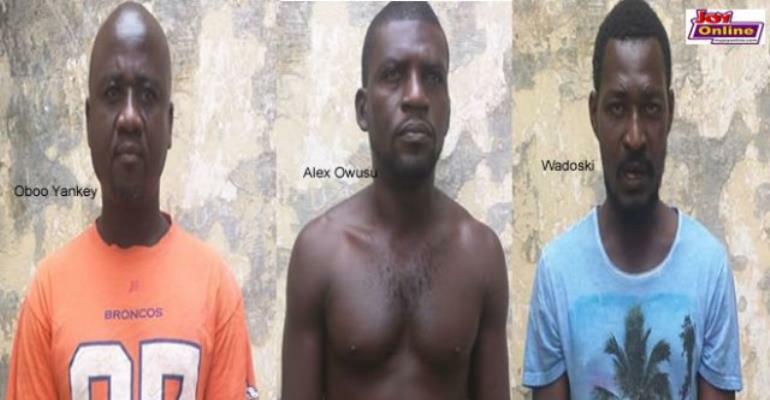 Four loyalists of the governing New Patriotic Party (NPP) in the Eastern Region have been charged with robbery after they allegedly broke into the residence of the New Juabeng constituency secretary and took away the album for the upcoming constituency election. They are; Alex Owusu 33, Wadosky 34, Obeng Manu 44 and Justice Afful alias Oboo Yankey 38. Two other accomplices named as Tanko and Mafia are however, on the run. They have also been accused of stealing a cash amount of GHÈ»4,700 and other personal belongings of the constituency secretary, Mr. Pius Tevi. They pleaded not guilty and were granted bail to the sum of GHÈ»100,000 each with two sureties to reappear in court on March 1, 2018. The lawyer for the accused persons, Francis Polley, had earlier told the court presided over by Her Honour, Mercy Addai Kotei, that there was no way the suspects could interfere in investigations if they were granted bail. Alex Owusu alias Gunta and Wadoski, allegedly broke into Tevi’s New Juabeng residence, blindfolded and tied him with a rope before bolting away with envelopes containing the constituency album, mobile phones, cash and other personal belongings. They claimed to have been hired by Obeng Manu who is the constituency organiser, to perpetuate the crime. Obeng Manu, who was later arrested, denied claims of hiring the thugs. The New Juaben District Police Command says the offence is criminal for which the suspects must face the consequences.